Your child should start by simply trying to make the Bead Patterns shown. This activity builds a familiarity with the components of Mac's Abacus and how they move. Some of these patterns are simply aesthetic. But others (A, B, C, D, E, M, N, O & P) draw a subtitle attention to counts, as your child arranges the Beads into Groups of 2, 3, 4, 5, 9 & 10. Kids really love this part! Row 1 (the Green Beads) is used to represent the number of fingers you are holding up. Addition is demonstrated by combining the counts of fingers on both hands. Other finger combinations, not pictured, are offered at the bottom of the page. Row 1 (Green Beads) is used to count various objects, demonstrating the general nature of using an Abacus as a counter. The second Row (Blue Beads) is defined as each Bead being worth 10 Counts. The equivalence of 10 Beads on Row 1 and 1 Bead on Row 2 is demonstrated. The Carry is introduced as a Trade of 10 Beads on Row 1 for 1 Bead on Row 2. The Carry is generalized as the way to count into the Hundreds and Thousands. Each Bead on Row 3 (Red) is worth 100 Counts, while each Bead on Row 4 (Purple) is worth 1000 Counts (place value). Mac's Abacus can easily count to 10,000. This page focuses on the Coins. Each Count is worth 1 Penny. The Carry is used as needed. Note that there are many combinations that add up to 25 Cents. The Dots between the Blue and Red Rows separate the Dollars from the Cents. The paper Bills are introduced ($1.00 = 100 Pennies, $5.00 = 500 Pennies, $10.00 = 1000 Pennies and $20.00 = 2000 Pennies). 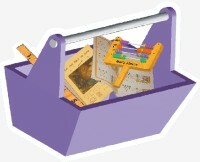 The last activity demonstrates how Mac's Abacus can be used to keep a running tally of “Bought“ items. Three illustrations demonstrate the equivalence between Numbers (or Money) as represented on Mac's Abacus and as normally written using our Decimal System. 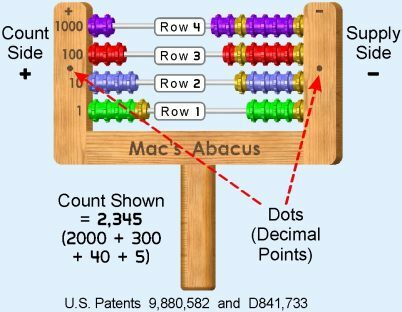 Holding Mac's Abacus sideways conveniently lines up the Bead Rows with the Decimal Digits (place value). The Step-by-Step procedure for Adding two numbers is both illustrated and explained. Two problems are examined. The first has a couple of simple Carrys. The second example shows how Carrys can propagate up the Bead Rows. This page is also part of our Mac's Abacus Basic Workbook. The Step-by-Step procedure for Subtracting two numbers is both illustrated and explained. Two problems are examined. The first has a couple of simple Borrows. The second example requires three Borrows to set up the Bead Rows before the subtraction is made. This page is also part of our Mac's Abacus Basic Workbook. 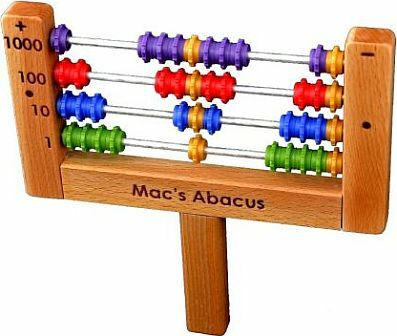 The procedure for Subtracting with Mac's Abacus is demonstrated by sequentially subtracting one Bead (count) at a time, starting at Six Counts and proceeding to Zero Counts. This is also a good way to demonstrate the concept of Zero. This Poster is also on the inside back cover of our Mac's Abacus Basic Workbook. The Counts from 1 to 10 are illustrated using: Fingers, Digits and various objects. These Counts are projected along a row of Abacus Beads.This Poster is also the back cover of our Mac's Abacus Basic Workbook.